One Plus Partnership's cinema, located in a large Book City store in the southeastern Chinese city of Nanchang, takes inspiration from both books and film. Black and white, the colour scheme used in the two forms of media, is the main visual component informing the cinema design. 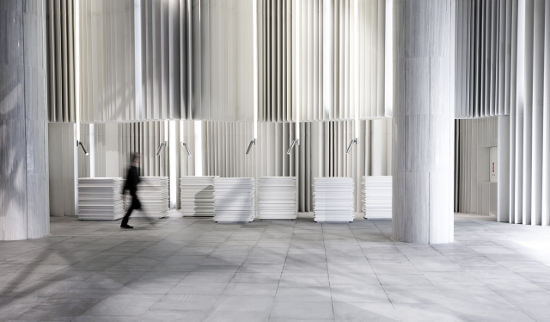 The entrance is marked by a sea of whiteness, designed to mimic the pages of a book. Located in the middle of the lobby, there are stacks of what seems like paper on the floor, but these are, in fact, cash desks made of white Corian. Passing through the lobby into the hallway, and the surroundings switch from white to a striking black. Words in different fonts and colours, extracted from famous films, are scattered randomly on the walls. One of the highlights is a room outside the cinema screens that has narrow strips of green cylindrical spotlights, arranged in a criss-cross manner hanging from the ceiling.